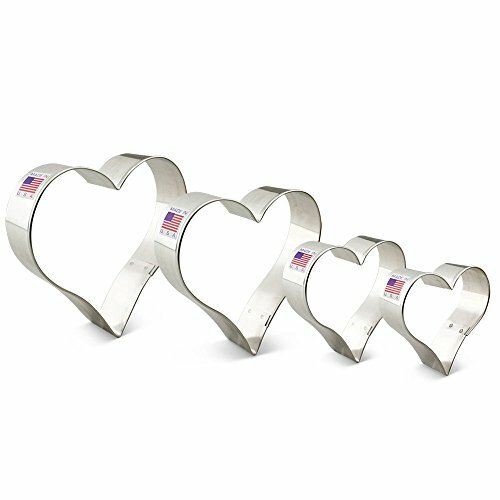 Teardrop Heart - 2 7/8" x 2 5/8"
Teardrop Heart - 3 7/16" x 3 1/4"
Teardrop Heart - 3 7/8" x 3 5/8"
Teardrop Heart - 4 1/4" x 4"
HEART COOKIE CUTTER SET - Make heart shaped cookies with our Heart Cookie Cutters. Celebrate love, Valentine's Day, weddings, and engagements with beautifully decorated cookies, fun fondant shapes, original craft projects or cookie cutter favors. FAMILY OWNED - Family owned and operated since 1989, Ann Clark Cookie Cutters has grown from a small gift company to the largest manufacturer of cookie cutters in America. TESTED/CERTIFIED FOOD SAFE - Our cutters are made from steel manufactured right here in the USA, and our products have all been certified as food safe. If you have any questions about this product by Ann Clark Cookie Cutters, contact us by completing and submitting the form below. If you are looking for a specif part number, please include it with your message.